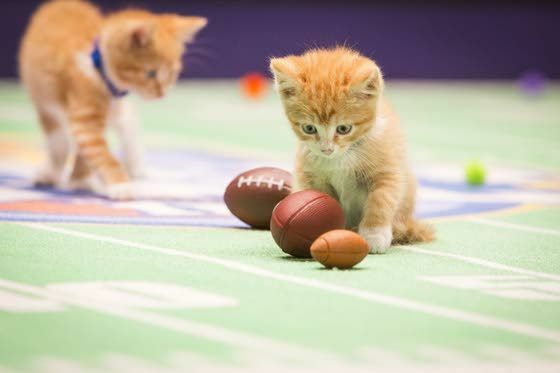 &lsquo;Kitten Bowl&rsquo; returns noon today on Hallmark Channel. The inaugural Kitten Bowl faced a daunting task last Feb. 2, not only being on against Super Bowl pregame shows but also its counterpart in animal adorableness, the venerable, decade-old Puppy Bowl on Animal Planet. Despite it all, the event proved to be a ratings hit for Hallmark Channel and today - on Super Bowl Sunday 2015 - it's back, bigger and better than ever, according to host Beth Stern. That includes the recent addition of Boomer Esiason as commissioner of the Feline Football League, as well as a larger field, an increase in kittens from 71 to 92 and the inclusion of adult cats. "Everything about Kitten Bowl has been so tremendous," said Stern, whose husband is radio personality Howard Stern. Most importantly, she said, the event has raised awareness for animal adoption. Like last year, every kitten on the show, which was recorded several months ago, already has been adopted. Others surely will be during and after the show itself. "When I walk down the street people tell me how adorable Kitten Bowl is, or that they saw a cute black kitten on Kitten Bowl and they went to the local shelter and adopted a black cat," Stern said. "When people are watching and see how cute the kittens are, there are going to be little specials at all our partner shelters where people can adopt kittens and cats." The kittens used on the show came from North Shore Animal League America, for which she has been a longtime spokeswoman, as well as Last Hope Animal Rescue. John Sterling, the Yan-kees' radio play-by-play man, is back on the show, joined by Mary Carillo and a number of celebrity guests. But Stern said there is no need to wait for the big game to begin today. "What's so great is people can go online on the Hallmark Channel [website] and see some preliminary cuteness of kittens leading up to the big game," she said. "They get to see players that are going to be competing in the preliminary round and the championship game. "It was such a ratings hit last year, they just decided to expand it and have more fun with it. It's turned into a whole thing and I love it. I'm so excited." Stern had planned last year to watch the Puppy Bowl as well, but she never got around to it because she was so "mesmerized" by the Kitten Bowl. "The way Hallmark Channel edits it and made it such a fun, fun event I couldn't keep my eyes off of it," she said. "So we'll see what happens this year. I think again it's going to be me watching the Super Bowl, cutting to the Kitten Bowl, then back to the Super Bowl." Stern grew up a Steelers fan in western Pennsylvania and one of her brothers, Doug, was a tight end at Penn State in the mid-1990s. "It's best not to talk about that," she said of the Steelers' flop this season. "I love my Steelers and it was such a disappointment, but this year I'm rooting for the black cats on the Kitten Bowl. I'm not going to be rooting for any of the Super Bowl teams . . . My Steelers are out and I don't care about any of the other teams." Stern said she and Howard regularly are invited to attend Super Bowls but never have, even last year when it was at MetLife Stadium. "I mean, that would be a little crazy for him," she said, referring to Stern's celebrity status. The Sterns have been seen on celebrity row at a number of Knicks games, and have tickets later this month, Beth said. "I don't know who they're playing," she said. "I guess it doesn't even matter at this point. We enjoy the spirit and energy in the room and love sitting courtside. I love basketball so much that I really love being on the court and just seeing the action so close and personal. "They literally spit on you and I love it and sweat on you and I love it. I love going to the games even though it has not been the best season . . . I always feel so lucky and honored to be sitting in those courtside seats and seeing the action so close. It's so fun. I don't care how bad the team is, it's still a treat for us." Stern, 42, would like to see the Kitten Bowl continue far into the future. "Oh, my gosh, yeah," she said. "I mean, the way people responded to the first, I see Kitten Bowl 50 in the future. I'm going to be 100 years old, hopefully still hosting the Kitten Bowl."